I love birthdays — actually, forget birthdays; here we celebrate birthweeks or birthmonths! — but the one challenge we face in creating fun yearly traditions is that three of our daughters have birthdays within three weeks of each other. That’s a lot of celebrating! We’re slowly creating yearly traditions that are doable on that timetable, and the girls all enjoy choosing their special birthday breakfast (often waffles with whipped cream and a candle on top!) and cake flavor (everything from banana cake with cream cheese icing to chocolate cupcakes). We also do friend birthday parties on specific years (our plan is when they turn 5, 9, 13, 16 and then high school graduation), but on the off years they’re able to invite one friend over or out to eat or play with us somewhere, and I think they almost look forward to those years more than the full-blown parties! 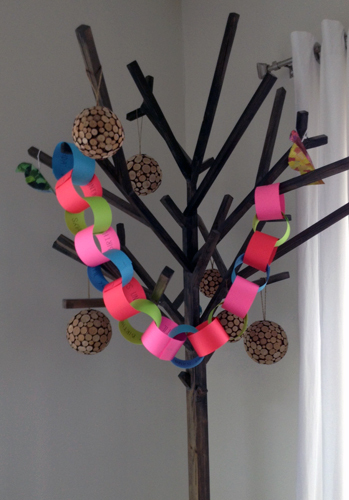 Another one of our favorite activities for any birthday or holiday is a paper countdown chain or a dry erase countdown calendar on a window. Definitely a fun way to draw out the anticipation and celebration! With that in mind, I made this fun countdown chain for our second daughter’s 7th birthday, which is in 15 days, and first thing this morning she ran downstairs, “I get to take off a link now, right? !” Even though she knew it was 15 days until her birthday, she was excited to see the message inside, and I have a feeling that excitement will last through the next two weeks! 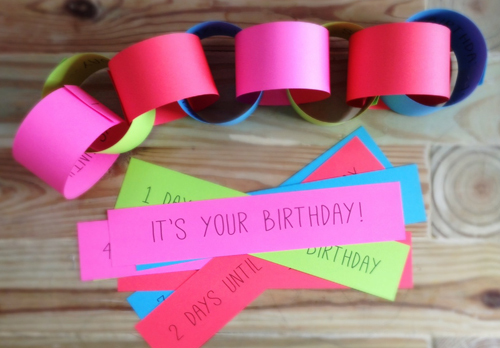 Click here to download or print the birthday countdown chain. How do you celebrate birthdays in your family?